There are times when one equilibrium reaction does not adequately describe the system being studied. Sometimes we have more than one type of equilibrium occurring at once (for example, an acid-base reaction and a precipitation reaction). The excess H+ ions make seawater more acidic. Increased ocean acidification can then have negative impacts on reef-building coral, as they cannot absorb the calcium carbonate they need to grow and maintain their skeletons ([link]). This in turn disrupts the local biosystem that depends upon the health of the reefs for its survival. If enough local reefs are similarly affected, the disruptions to sea life can be felt globally. The world’s oceans are presently in the midst of a period of intense acidification, believed to have begun in the mid-nineteenth century, and which is now accelerating at a rate faster than any change to oceanic pH in the last 20 million years. Learn more about ocean acidification and how it affects other marine creatures. This site has detailed information about how ocean acidification specifically affects coral reefs. Slightly soluble solids derived from weak acids generally dissolve in strong acids, unless their solubility products are extremely small. For example, we can dissolve CuCO3, FeS, and Ca3(PO4)2 in HCl because their basic anions react to form weak acids (H2CO3, H2S, and The resulting decrease in the concentration of the anion results in a shift of the equilibrium concentrations to the right in accordance with Le Châtelier’s principle. 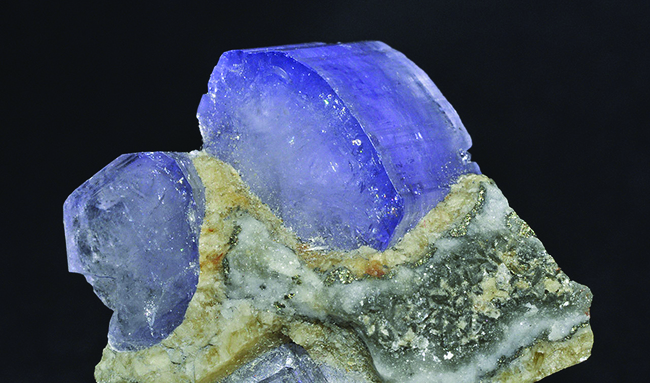 Crystal of the mineral hydroxylapatite, Ca5(PO4)3OH, is shown here. Pure apatite is white, but like many other minerals, this sample is colored because of the presence of impurities. The resulting Ca5(PO4)3F is slightly less soluble than Ca5(PO4)3OH, and F– is a weaker base than OH–. Both of these factors make the fluorapatite more resistant to attack by acids than hydroxylapatite. See the Chemistry in Everyday Life feature on the role of fluoride in preventing tooth decay for more information. As we saw previously, fluoride ions help protect our teeth by reacting with hydroxylapatite to form fluorapatite, Ca5(PO4)3F. Since it lacks a hydroxide ion, fluorapatite is more resistant to attacks by acids in our mouths and is thus less soluble, protecting our teeth. Scientists discovered that naturally fluorinated water could be beneficial to your teeth, and so it became common practice to add fluoride to drinking water. Toothpastes and mouthwashes also contain amounts of fluoride ([link]). Fluoride, found in many toothpastes, helps prevent tooth decay (credit: Kerry Ceszyk). Unfortunately, excess fluoride can negate its advantages. Natural sources of drinking water in various parts of the world have varying concentrations of fluoride, and places where that concentration is high are prone to certain health risks when there is no other source of drinking water. The most serious side effect of excess fluoride is the bone disease, skeletal fluorosis. When excess fluoride is in the body, it can cause the joints to stiffen and the bones to thicken. It can severely impact mobility and can negatively affect the thyroid gland. Skeletal fluorosis is a condition that over 2.7 million people suffer from across the world. So while fluoride can protect our teeth from decay, the US Environmental Protection Agency sets a maximum level of 4 ppm (4 mg/L) of fluoride in drinking water in the US. Fluoride levels in water are not regulated in all countries, so fluorosis is a problem in areas with high levels of fluoride in the groundwater. Calcium hydrogen carbonate, Ca(HCO3)2, is soluble, so limestone and marble objects slowly dissolve in acid rain. These reactions decrease the carbonate ion concentration, and additional calcium carbonate dissolves. If enough acid is present, the concentration of carbonate ion is reduced to such a low level that the reaction quotient for the dissolution of calcium carbonate remains less than the solubility product of calcium carbonate, even after all of the calcium carbonate has dissolved. Calculate the concentration of ammonium ion that is required to prevent the precipitation of Mg(OH)2 in a solution with [Mg2+] = 0.10 M and [NH3] = 0.10 M.
To prevent the formation of solid Mg(OH)2, we must adjust the concentration of OH– so that the reaction quotient for Equation (1), Q = [Mg2+][OH–]2, is less than Ksp for Mg(OH)2. (To simplify the calculation, we determine the concentration of OH– when Q = Ksp.) [OH–] can be reduced by the addition of which shifts Reaction (2) to the left and reduces [OH–]. Solid Mg(OH)2 will not form in this solution when [OH–] is less than 1.2 10–5M. We calculate the needed to decrease [OH–] to 1.2 10–5Mwhen [NH3] = 0.10. When equals 0.19 M, [OH–] will be 9.4 10–6M. Any greater than 0.19 M will reduce [OH–] below 9.4 10–6M and prevent the formation of Mg(OH)2.
and calculate the concentration of hydronium ion required to prevent the precipitation of ZnS in a solution that is 0.050 M in Zn2+ and saturated with H2S (0.10 M H2S). Therefore, precise calculations of the solubility of solids from the solubility product are limited to cases in which the only significant reaction occurring when the solid dissolves is the formation of its ions. When is 1.1 10–3M, [Ag+] is 9.4 10–11M and all AgBr remains dissolved. Thus, 1.00 L of a solution prepared from 1.9 g Na2S2O3 dissolves 1.0 g of AgBr. 1.00 L of a solution prepared with 4.81 g NH3 dissolves 2.0 g of AgCl. This could be important to a laundry because clothing washed in water that has a manganese concentration exceeding 0.1 mg per liter may be stained by the manganese. We can reduce the concentration of manganese by increasing the concentration of hydroxide ion. We could add, for example, a small amount of NaOH or some other base such as the silicates found in many laundry detergents. As the concentration of OH– ion increases, the equilibrium responds by shifting to the left and reducing the concentration of Mn2+ ion while increasing the amount of solid Mn(OH)2 in the equilibrium mixture, as predicted by Le Châtelier’s principle. What is the effect on the amount of solid Mg(OH)2 that dissolves and the concentrations of Mg2+ and OH– when each of the following are added to a mixture of solid Mg(OH)2 in water at equilibrium? (a) The reaction shifts to the left to relieve the stress produced by the additional Mg2+ ion, in accordance with Le Châtelier’s principle. In quantitative terms, the added Mg2+ causes the reaction quotient to be larger than the solubility product (Q > Ksp), and Mg(OH)2 forms until the reaction quotient again equals Ksp. At the new equilibrium, [OH–] is less and [Mg2+] is greater than in the solution of Mg(OH)2 in pure water. More solid Mg(OH)2 is present. (b) The reaction shifts to the left to relieve the stress of the additional OH– ion. Mg(OH)2 forms until the reaction quotient again equals Ksp. At the new equilibrium, [OH–] is greater and [Mg2+] is less than in the solution of Mg(OH)2 in pure water. More solid Mg(OH)2 is present. (c) The concentration of OH– is reduced as the OH– reacts with the acid. The reaction shifts to the right to relieve the stress of less OH– ion. In quantitative terms, the decrease in the OH– concentration causes the reaction quotient to be smaller than the solubility product (Q < Ksp), and additional Mg(OH)2 dissolves until the reaction quotient again equals Ksp. At the new equilibrium, [OH–] is less and [Mg2+] is greater than in the solution of Mg(OH)2 in pure water. More Mg(OH)2 is dissolved. Thus, changing the amount of solid magnesium hydroxide in the mixture has no effect on the value of Q, and no shift is required to restore Q to the value of the equilibrium constant. What is the effect on the amount of solid NiCO3 that dissolves and the concentrations of Ni2+ and when each of the following are added to a mixture of the slightly soluble solid NiCO3 and water at equilibrium? Several systems we encounter consist of multiple equilibria, systems where two or more equilibria processes are occurring simultaneously. Some common examples include acid rain, fluoridation, and dissolution of carbon dioxide in sea water. When looking at these systems, we need to consider each equilibrium separately and then combine the individual equilibrium constants into one solubility product or reaction quotient expression using the tools from the first equilibrium chapter. Le Châtelier’s principle also must be considered, as each reaction in a multiple equilibria system will shift toward reactants or products based on what is added to the initial reaction and how it affects each subsequent equilibrium reaction. A saturated solution of a slightly soluble electrolyte in contact with some of the solid electrolyte is said to be a system in equilibrium. Explain. Why is such a system called a heterogeneous equilibrium? Calculate the equilibrium concentration of Ni2+ in a 1.0-M solution [Ni(NH3)6](NO3)2. Calculate the equilibrium concentration of Cu2+ in a solution initially with 0.050 M Cu2+ and 1.00 M NH3. Calculate the equilibrium concentration of Zn2+ in a solution initially with 0.150 M Zn2+ and 2.50 M CN–. Calculate the Fe3+ equilibrium concentration when 0.0888 mole of K3[Fe(CN)6] is added to a solution with 0.0.00010 M CN–. Calculate the Co2+ equilibrium concentration when 0.100 mole of [Co(NH3)6](NO3)2 is added to a solution with 0.025 M NH3. Assume the volume is 1.00 L.
The equilibrium constant for the reaction is 1.6 1013. Is HgCl2 a strong electrolyte or a weak electrolyte? What are the concentrations of Hg2+ and Cl– in a 0.015-M solution of HgCl2? 6.2 10–6M = [Hg2+]; 1.2 10–5M = [Cl–]; The substance is a weak electrolyte because very little of the initial 0.015 M HgCl2 dissolved. What is the molar solubility of CaF2 in a 0.100-M solution of HF? Ka for HF = 7.2 10–4. What is the molar solubility of BaSO4 in a 0.250-M solution of NaHSO4? Ka for = 1.2 10–2. What is the molar solubility of Tl(OH)3 in a 0.10-M solution of NH3? What is the molar solubility of Pb(OH)2 in a 0.138-M solution of CH3NH2? A solution of 0.075 M CoBr2 is saturated with H2S ([H2S] = 0.10 M). What is the minimum pH at which CoS begins to precipitate? A 0.125-M solution of Mn(NO3)2 is saturated with H2S ([H2S] = 0.10 M). At what pH does MnS begin to precipitate? Calculate the molar solubility of BaF2 in a buffer solution containing 0.20 M HF and 0.20 M NaF. (b) What is the minimum pH at which PbF2 precipitates? Calculate the concentration of Cd2+ resulting from the dissolution of CdCO3 in a solution that is 0.250 M in CH3CO2H, 0.375 M in NaCH3CO2, and 0.010 M in H2CO3. Both AgCl and AgI dissolve in NH3. (a) What mass of AgI dissolves in 1.0 L of 1.0 M NH3? (b) What mass of AgCl dissolves in 1.0 L of 1.0 M NH3? Calculate the volume of 1.50 M CH3CO2H required to dissolve a precipitate composed of 350 mg each of CaCO3, SrCO3, and BaCO3. Even though Ca(OH)2 is an inexpensive base, its limited solubility restricts its use. What is the pH of a saturated solution of Ca(OH)2? The following question is taken from a Chemistry Advanced Placement Examination and is used with the permission of the Educational Testing Service. In a saturated solution of MgF2 at 18 °C, the concentration of Mg2+ is 1.21 10–3M. The equilibrium is represented by the preceding equation. (a) Write the expression for the solubility-product constant, Ksp, and calculate its value at 18 °C. (b) Calculate the equilibrium concentration of Mg2+ in 1.000 L of saturated MgF2 solution at 18 °C to which 0.100 mol of solid KF has been added. The KF dissolves completely. Assume the volume change is negligible. (c) Predict whether a precipitate of MgF2 will form when 100.0 mL of a 3.00 10–3–M solution of Mg(NO3)2 is mixed with 200.0 mL of a 2.00 10–3–M solution of NaF at 18 °C. Show the calculations to support your prediction. (d) At 27 °C the concentration of Mg2+ in a saturated solution of MgF2 is 1.17 10–3M. Is the dissolving of MgF2 in water an endothermic or an exothermic process? Give an explanation to support your conclusion. (c) Determine the concentration of Mg2+ and F– that will be present in the final volume. Compare the value of the ion product [Mg2+][F–]2 with Ksp. If this value is larger than Ksp, precipitation will occur. This value is smaller than Ksp, so no precipitation will occur. (d) MgF2 is less soluble at 27 °C than at 18 °C. Because added heat acts like an added reagent, when it appears on the product side, the Le Châtelier’s principle states that the equilibrium will shift to the reactants’ side to counter the stress. Consequently, less reagent will dissolve. This situation is found in our case. Therefore, the reaction is exothermic. Which of the following compounds, when dissolved in a 0.01-M solution of HClO4, has a solubility greater than in pure water: CuCl, CaCO3, MnS, PbBr2, CaF2? Explain your answer. Which of the following compounds, when dissolved in a 0.01-M solution of HClO4, has a solubility greater than in pure water: AgBr, BaF2, Ca3(PO4)3, ZnS, PbI2? Explain your answer. What is the effect on the amount of solid Mg(OH)2 that dissolves and the concentrations of Mg2+ and OH– when each of the following are added to a mixture of solid Mg(OH)2 and water at equilibrium? What is the effect on the amount of CaHPO4 that dissolves and the concentrations of Ca2+ and when each of the following are added to a mixture of solid CaHPO4 and water at equilibrium? Multiple Equilibria by OpenStaxCollege is licensed under a Creative Commons Attribution 4.0 International License, except where otherwise noted.